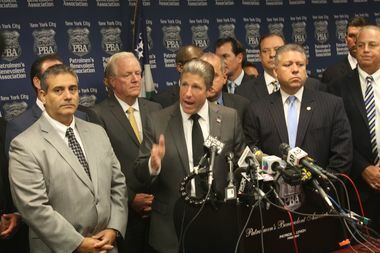 Police union bosses Pat Lynch, of the Patrolmen's Benevolent Association (C) vehemently denied that police used a chokehold during their arrest of Eric Garner. NEW YORK CITY — Patrick Lynch, the fiery president of the city’s largest police union, says he has “no regrets” over his emotional clash with Mayor Bill de Blasio last year after two police officers were gunned down in Bed-Stuy. Lynch said he was merely expressing the raw sentiment of his 23,000 members following the December assassinations of officers Rafael Ramos and Wenjian Liu who were killed by a gunman as they sat in their patrol car. He believes, in fact, that his assertion that de Blasio was partly to blame for the tragedy — along with the public’s shock over the senseless slayings — motivated the mayor to show support for police officers in demonstrative ways, such as buying bulletproof vests and vetoing a City Council bill that would make chokeholds illegal. “[The mayor] has absolutely reacted to the responses of not only the police, but to the public in general, which was saying 'Enough is Enough' with his constant criticisms and that he needed to be supportive of police in every way possible,” Lynch told “On The Inside." “People at the time were seeing a mayor and an administration that was supporting demonstrators, allowing them to say whatever they wanted, to say ‘Death to cops’ and to protest wherever they wanted,” Lynch said. “In the meantime, we were saying for months that the situation was getting extremely dangerous and that police officers were being hurt, and then the murders occurred." He recalled watching officers stream into Woodhull Hospital, some in “pure shock” knowing that the unthinkable had occurred. “The opinion expressed at that instant (at the hospital) was exactly how New York City officers felt,” Lynch said. “And as president, I only reflect the thoughts and feelings of my members." The calamity turned a tense relationship between New York’s Finest and de Blasio into a full-blown rift that nearly crippled law enforcement in the Big Apple. De Blasio was elected largely by criticizing NYPD practices such as stop-and-frisk. Following the controversial death of Eric Garner, the mayor further enraged the NYPD’s rank-and-file by saying he feared how police would treat his son, Dante. Then protesters began to express anti-police rhetoric and, ultimately, Liu and Ramos were murdered sitting in their squad car. For his part, de Blasio insisted that he had always been supportive of police and was only critical of NYPD strategies that eroded community relations, particularly in minority neighborhoods. After the funerals for Ramos and Liu, the war of words between police unions and de Blasio was toned down as officials sought common ground. The mayor then started taking pro-police positions. In addition to purchasing new vests and vetoing the City Council’s bill, de Blasio began admonishing protesters who called for violence against police and reversed the city’s position on settling frivolous lawsuits against New York’s Finest. He even cautioned the public to allow the criminal justice system to run its course following the indictment of Officer Peter Liang in the fatal shooting of Akai Gurley in Brooklyn’s Pink Houses — a dramatic change in tone from his expression of dismay over the outcome of the Eric Garner grand jury. De Blasio has maintained that these decisions were not politically motivated and were based on the merits. Lynch believes the police unions shaped the change. “I think [the mayor] is responding in this way because we were aggressive, speaking what police officers thought,” Lynch said. “I believe that the mayor knows he has to support and equip the city’s police officers and he has to be very, very careful about what he says, to show support so that people on the street know it and that criminals know that it is not rhetoric, it is reality." Lynch, 51, said he and the mayor are cordial when they meet at various events. And while he is buoyed by de Blasio's recent pro-police positions, and would meet with him at any time, Lynch says his members have been "looking for substantial change, and sustained change, and not just when people are looking." Lynch for the second time since becoming PBA leaders faces a challenge to his presidency later this spring. He believes his members know his record for fighting for them, but his opponents feel differently and that it is time for a change. But he believes the public understands that he is an advocate for police officers. “It is my job to talk about the difficulty of our jobs, to provide the opinion of the police officers at any given time, to give their perspective and tell their story,” Lynch said.